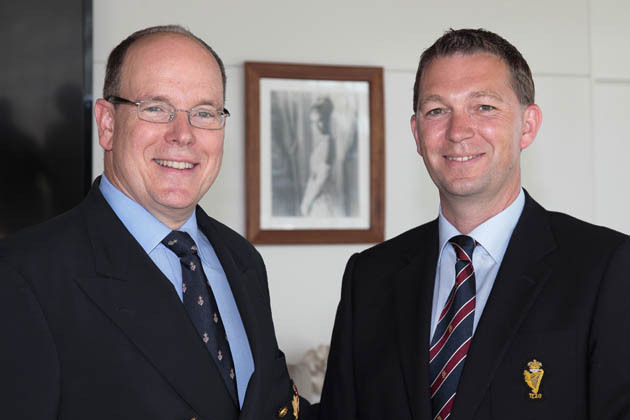 His Serene Highness The Sovereign Prince of Monaco Albert II and Royal Cork Yacht Club General Manager Gavin Deane, enjoying a relaxing moment during the ceremony. Gavin met with HSH Prince Albert II, President YCM, Bernard d’Alessandri, General Secretary/Director YCM and the Club’s Board Committee at a private reception in the Club. HSH Prince Albert II and Gavin Deane signed the Twinning Agreement, exchanged framed Club burgees, Club history books and Club ties. Outline of agreement: “The two Clubs base the agreement upon a reciprocal engagement to mutually support and promote the Clubs’ Sporting Programmes and Social Events. Members of the two Clubs shall benefit from the Structures and Services offered by each Club in conformity with agreed regulations”. 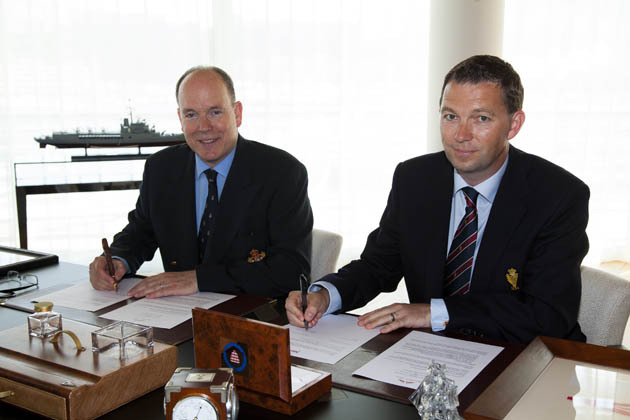 HSH Prince Albert II, President Yacht Club de Monaco and Gavin Deane, General Manager, Royal Cork Yacht Club signing the Agreement. The relationship between the Clubs has flourished over the past five to six years as Royal Cork Yacht Club sends an Optimist team to race at an event in Monaco every January. Other RCYC members that joined Gavin at the event were Eddie Jordan (F1 fame) and Harry Gibbings (originally from Cork), both of whom reside in Monaco and are overseas members of Royal Cork Yacht Club. 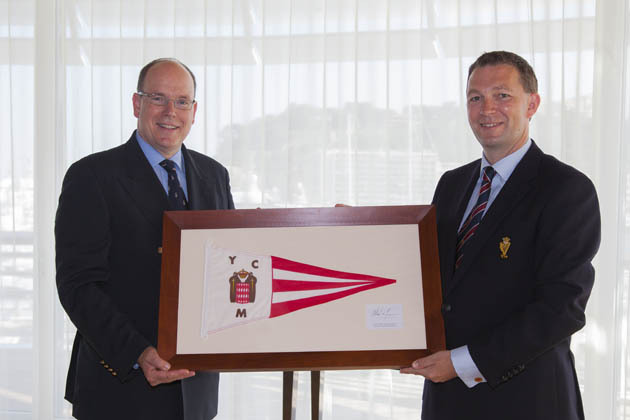 HSH Prince Albert II, President YCM, recently became a member of the Royal Cork Yacht Club, and when our General Manager Gavin was introduced to him he proudly produced his Royal Cork Membership card from his pocket. Speaking with Gavin as he very eloquently described his visit to Monaco one could almost feel as if one were there and it certainly seemed to live up to all the wonderful tales one hears about the Principality . He described the beautiful azure sea and the marinas filled with exotic and wonderful craft of all types and sizes and the beauty of the architecture and buildings, and the friendliness of the people. The temperature was some 30 degrees and all in all appeared to be a dream location to live. The twinning of the two yacht clubs brings our relationship with Monaco even closer. Monaco is held in very high esteem by the Irish people and particularly through the deep affection felt for the late HSH Princess Grace of Monaco, wife of the late Prince Rainier of Monaco. They brought their family to visit Ireland and and Princess Grace also made other visits here. She was very interested in and proud of her Irish ancestry and was greatly admired by the Irish people for her charm and beauty. 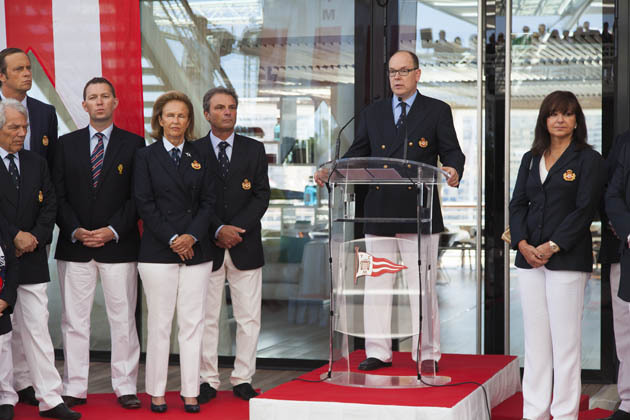 The Twinning of the Yacht Club de Monaco and the Royal Cork Yacht Club is indeed a proud occasion for us all.